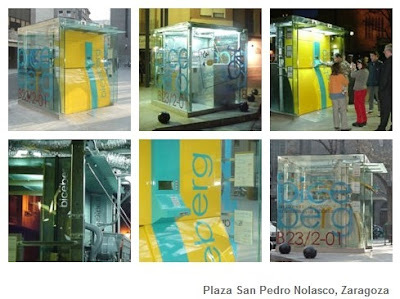 Photos of the Biceberg in Zaragoza. I'm liking this one. 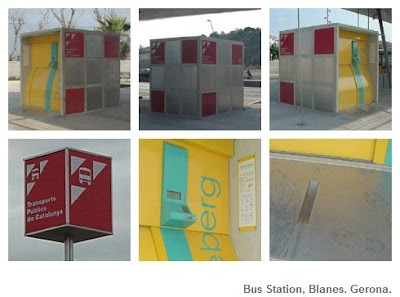 A Spanish company has developed an effective underground bike parking system they called The Biceberg. They come in different sizes and depths, depending on needs and space requirements. There are different sizes available - 23, 46, 69 or 92 bicycles. Depending on the size the watertight container that stores the bikes needs a hole between 1.5 m and 5.25 m in depth. It takes thirty seconds to drop off or retrieve your bike. The system works with a subscription card with a chip. As far as I can see it is for subscribers who will use it daily. Last year we posted about automated bicycle parking in Tokyo in the same vein. In Toyko, however, it's a high-volume affair at train stations. These Bicebergs are meant for smaller volume but also for spaces that are tighter. See more on the company's website here. Photos of the Biceberg in Gerona. Here's a little film from the company's website. Thanks to Mayte for the heads up.